This week's Project Pastry Queen recipe is a doozy. I have been drooling over these for years now, but for some reason couldn't ever get around to making them. And it is most definitely one of the most decadent recipes I've ever made. You start with a shortbread crust that is dotted with chopped peanuts. Top it with chopped Snickers bars. Top that with a sweet and gooey filling that's reminiscent of pecan pie filling. 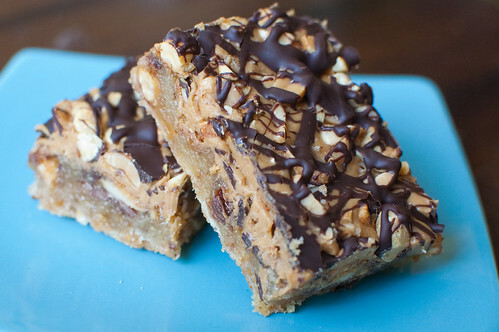 Finish with a layer of peanut butter, more peanuts, and finally, a drizzle of chocolate. So yeah, pretty intense. The good news is, for as many components as they have, they couldn't be easier to put together. Though maybe that should be bad news. Oh my goodness. These sound sinfully delicious. These look amazing! I'd love one right now. Geeee wiz that looks crazy delicious!!!! Bookmarked!